WHO recently published a new guidance document: “A practical handbook for planning, implementing and strengthening vaccination in the second year of life” (2YL Handbook). 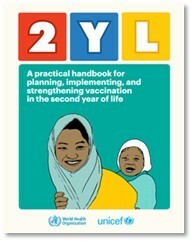 The 2YL Handbook provides detail on the practical steps for planning, managing, implementing, and monitoring vaccination during a scheduled visit, or visits, in the second year of life. It also provides useful steps for strengthening vaccination when coverage in the 2YL has not reached programme targets. It is designed to be used together with the 2YL guidance “Establishing and strengthening immunization in the second year of life: practices for vaccination beyond infancy”.